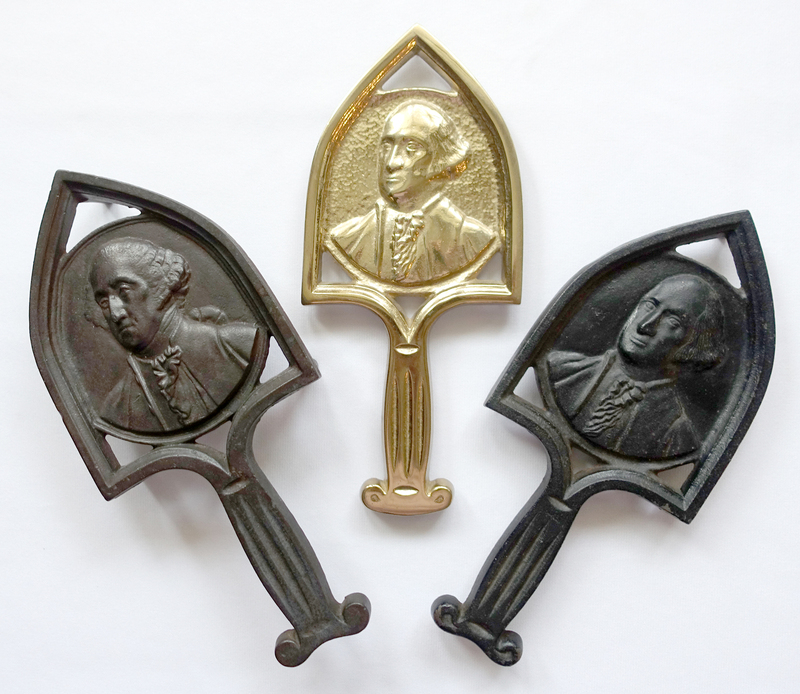 In my last blog post I described the original George Washington trivet. 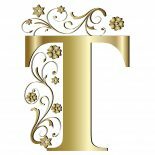 You may also want to review my 3-part series on Antique trivets, Vintage trivets and Contemporary trivets. There have been many reproductions of the George Washington trivet over the past 140 years. Some repros are over 100 years old and antiques in their own right. Others were mass produced in the mid-20th century. So … if the design has remained essentially unchanged over times, how can a newer reproduction be differentiated from an earlier casting? QUALITY OF DETAIL: Note how much more intricately detailed the original and antique designs are compared to the two mass produced contemporary trivets. Note also what looks like a pigtail, hair bow, or silk hair bag visible over George Washington’s shoulder on the two older castings. Contemporary reproductions often don’t include this detail. HANDLE: The original design featured a handle that was open in the center. Most reproductions feature a solid handle. CASTING MARK: Antique and older vintage reproductions will have either a sprue, wedge or poorly filed gate mark. You won’t be able to detect the gate mark on a contemporary casting because it would have been removed during the finishing process. SIGNATURE: The original George Washington trivet had no inscription on the reverse. Antique reproductions weren’t typically signed; vintage trivets might have a stock number. Contemporary reproductions like those from JZH, Dirilyte, Virginia Metalcrafters and others are imprinted with the company name and sometimes other information such as a date, logo or the abbreviated name GEO WASHINGTON. BACK-COPING: Back-coping refers to a routing out of sections of the trivet reverse in order to decrease both the amount of metal needed and the weight of the final casting. There is back-coping to all four of the trivets I share below. However, reproductions from other foundries may be completely flat on the reverse. LEGS: Modern reproductions, meant for light counter-top use or wall display, have legs that are short, straight and round on cross-section. The legs on older vintage or antique reproductions will be longer. WEAR: Trivets will show wear commensurate with age. Contemporary trivets may show rust (on cast iron) or tarnish (on brass) but likely will have minimal surface wear. Older trivets may show wear on the higher points such as the bridge of the nose or along George’s ruffled cravat (neck wear). Dirilyte was a term for beautiful golden, hard metal alloy products sold from 1936 to 1986. 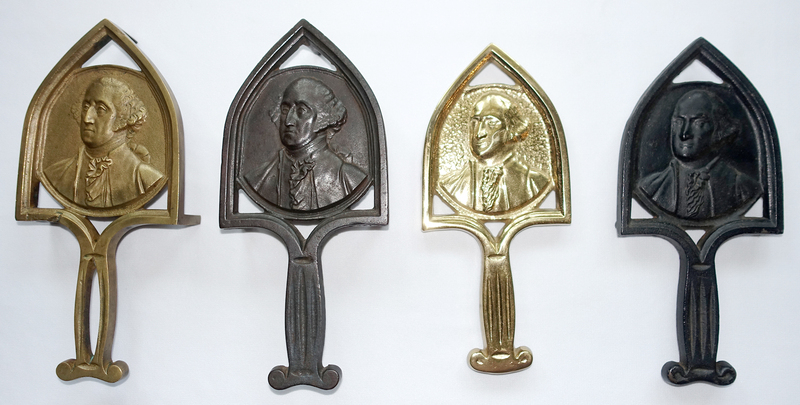 More famous for their flatware, a few trivets were produced, the most familiar being the George Washington reproduction signed Dirilyte. Products sold after 1961 had a bonded, non-tarnish coating applied which should not be polished. The company, now known as the Dirilyte Line, still operates today in Warsaw, Indiana. Although they have not made metal items in years, they still market a polish to be used on pre-1961 Dirilyte. The potential value of any trivet is determined by age, condition, rarity and desirability; the same is true when shopping for a George Washington trivet. Contemporary reproductions are plentiful and affordable. Older trivets, especially with a prominent casting mark, are more desirable and command a higher price. And, of course, the most desirable trivet would be the original, circa 1876 George Washington trivet in brass with an open handle, long legs and and showing signs on the reverse suggesting its origin via wax casting. This entry was posted on October 1, 2017 by Lynn Rosack in Reproduction Trivets and tagged brass, cast iron, Dirilyte, George Washington.